Kilimanjaro Dispatch: August 3, 2015 – Steve and Annie are in Africa! There was a one day lay over in Amsterdam due to a delayed KLM flight from North America, but our two adventurers are with the Berg Adventures team in Arusha now. Steve told us that the extra 24 hours in Holland helped them rest a bit and begin to get over jet lag. You can see from these photos that the team hit the ground running at the Arusha's Mount Meru Hotel Monday night withArnold and their Chief Mountain Guide, Thomas. They will be off to the west side of Kilimanjaro early on Tuesday morning. The climb will start on schedule and Steve and Annie look prepared. Here we go! 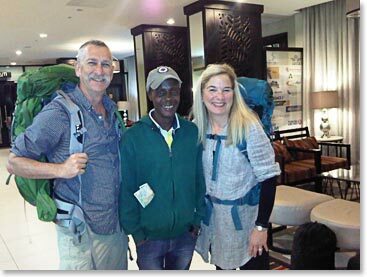 Arnold got this shot of Steve and Ann in the lobby of The Mount Meru Hotel Monday night, They arrived on time from Amsterdam and were checking into the hotel by 10:00 PM. There was time to go over some maps and check out their planned route on Kili. And there was time for a gear check! After months of planning and wondering, "do I have the right equipment? ", Thomas and the guides were ready to help answer questions and get the final packing for the mountain done.